The convertible PC market is gaining breadth as manufacturers release more and more notebooks at all sorts of prices. With its 11.6-inch display diagonal, our test device is about as compact as the competition from Sony. The Sony Vaio Fit 11A is a somewhat more expensive convertible notebook that offers somewhat superior hardware. 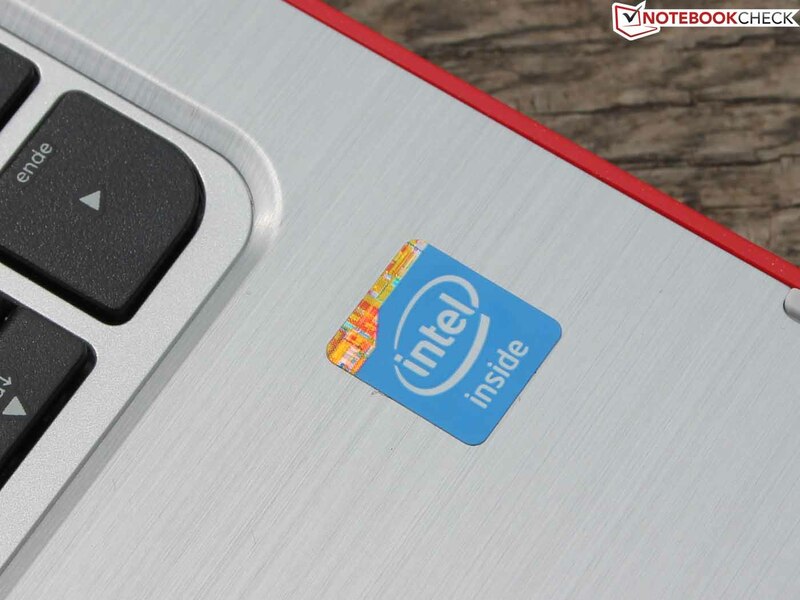 Still, we wanted to pit the HP Pavilion x360's Intel Celeron N2820 against its rival's Intel Celeron N2920 and see how they compare in practice. If you are looking for more performance and flexibility, we suggest you take a look at the Asus Transformer Book T100TA-C1-GR. Whereas the flexible devices from Sony and HP, the Vaio Fit 11A and the x360, are equipped with Intel Celeron chipsets from the Bay Trail M generation, the Asus computer has a quad-core Atom processor from the same generation. The x360 also comes in gray. 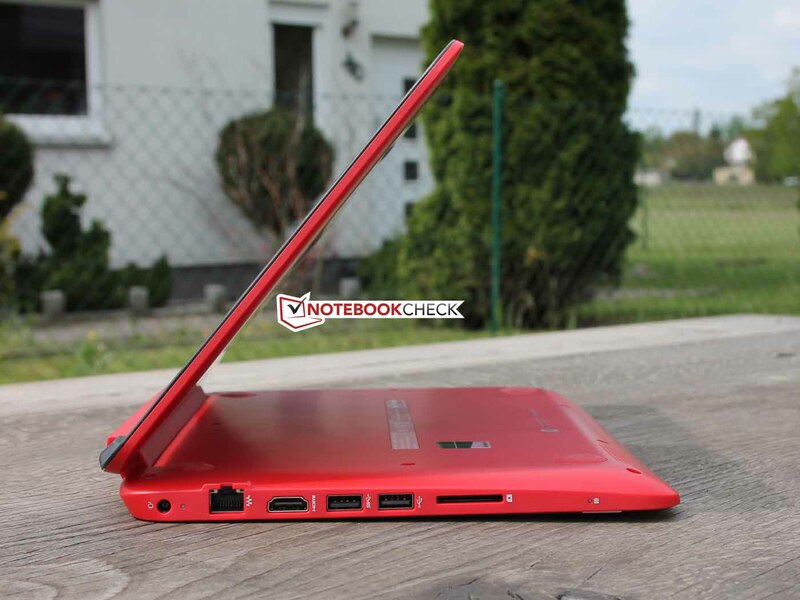 The HP Pavilion 11-n070eg x360 struts about in bright red. For those who prefer something a little less bold, there is also a more neutral gray edition, the HP Pavilion 11-n071eg x360. The color is the only difference between the two models. The HP Logo located on the top of the lid is made of reflective material surrounding the letters "hp" and stands out against the matte finish on the rest of the device. When shut, the lid can be pressed inward more than it ought, but this yield to pressure is not accompanied by any creaking or cracking sounds. 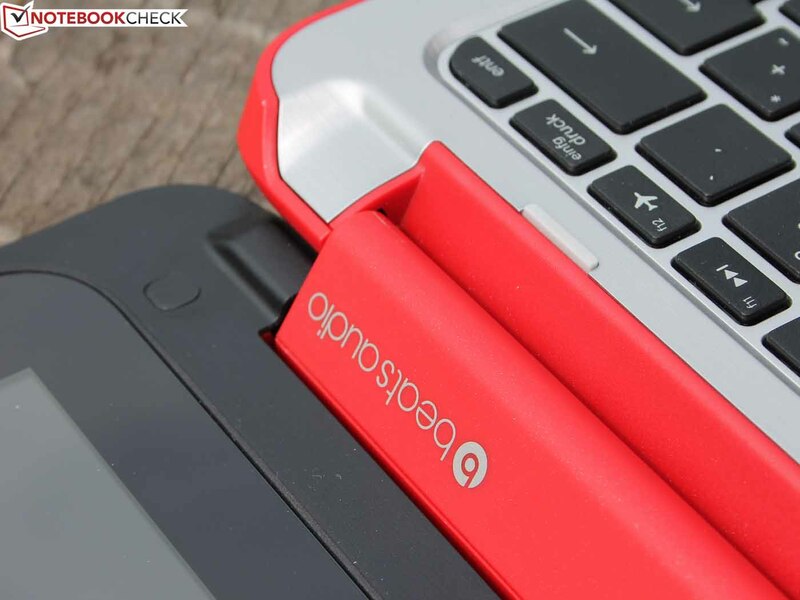 The plastic HP used on the outside of the laptop makes the device look relatively high quality, but it is not very resistant to fingerprints. 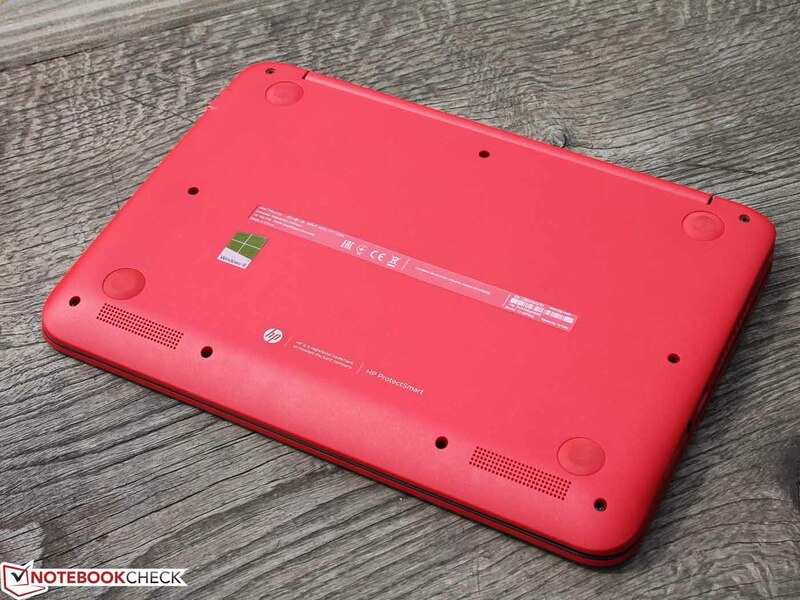 When open, it becomes clear that the HP Pavilion x360's hinge is also made of plastic. The folding mechanism is also imprinted with the Beats Audio logo. 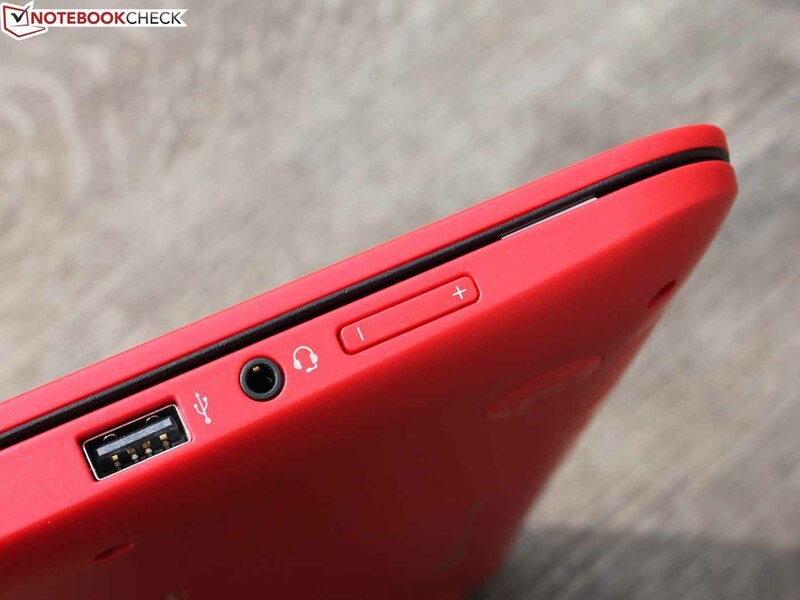 The hinge appears very sturdy to us, as it is much beefier than the two hinges on the Lenovo IdeaPad Yoga 2 11 (one of its competitors). The area around the keyboard, on the other hand, is constructed entirely of aluminum. As a result, the convertible laptop does not yield even to strong pressure if you press to the left or right of the touchpad. It is not possible to open this device with one hand, and the display bounces noticeably after being adjusted. In addition, the bottom portion of the notebook rocks upwards if you push somewhat forcefully against the top of the display. All in all, besides these minor inconveniences, the HP Pavilion x360's manufacturing quality is respectable. The back side does not have a maintenance hatch. The hinge proves to be very stable. The HP Pavillon x360's folding mechanism. The HP Pavilion x360 has three USB ports. Two of them are from the USB 2.0 generation, and one of them is of the up-to-date USB 3.0 variety. HP also equipped the laptop with an SD memory card slot. A headphone jack is integrated for use with external audio devices. 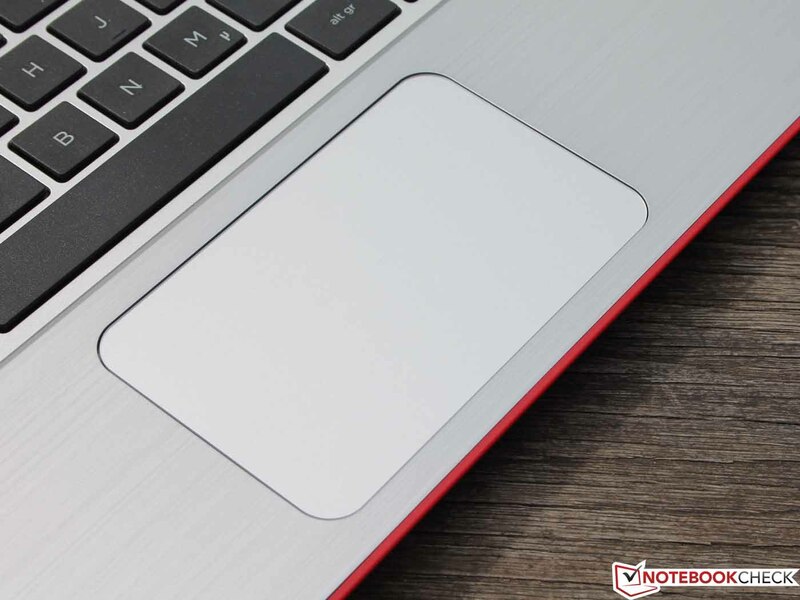 In terms of buttons, the power button and the volume rocker are both located on the left side of the notebook. Two LEDs inform the user of the convertible PC's current status. A little light to the right on the power button reveals whether the device is in standby mode (the LED blinks) or active (the LED glows continuously). On the right side, HP integrated a little diode to provide information about the system's hard drive activity. An HDMI connection is also provided. To the right: 2 USB ports, HDMI and the card reader. To the left: the power button, a USB port, the volume rocker and the audio jack. WLAN standards 802.11b/g/n and a LAN connection also come in the mix. Bluetooth 4.0 represents a further wireless standard. In our tests, the WLAN reception was good: Both the signal strength and the speed were always high (at the author's settings). The AR9565-WLAN module from Atheros does its job well. Above the display, HP integrated an HD webcam for video chatting software like Skype. Unfortunately, its quality is very poor: Photos are plagued with image noise and have hardly any details or contours. The camera takes jerky videos, and even the resulting recordings stutter! We have never experienced anything quite like this with any other device (high-performance mode). The microphone is not much good either -- recorded speech is beset with a tinny echo. The HP Pavilion 11-n070eg x360 comes accompanied by a setup guide and a warranty booklet. The package includes neither a stylus nor a pair of headphones to complement the Beats Audio. 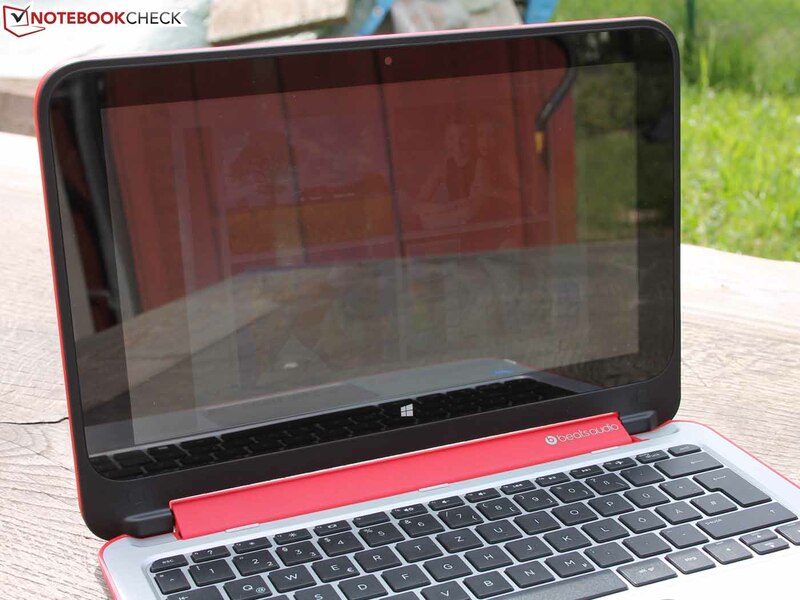 HP offers their Pavilion x360 with a one-year limited warranty. This applies to parts, labor, and a pick-up-and-delivery service. The Sony Vaio Fit 11A comes with a 2-year manufacturer's warranty, as does the Asus T100TA. The HP Pavilion x360 does a good job here. The Island Style layout (97%) offers a generous amount of space between the individual keys. The top row with the function keys is very narrow, and there is no number block. The status LEDs merit some extra points. One little light shows whether the Caps Lock is active, while another diode on the mute key informs the user whether the volume is on or off. Unfortunately, the keyboard feedback during typing is not perfect, as the keys' travel length is much too short. The click point is crisp, but because the keys reach the click point so quickly, this is of little help. The keystroke is solid and the key surfaces do not bend when pressure is applied. The touchpad reacts just as it ought; it also supports multi-touch gestures. There are no separate mouse-replacement keys; the left and right corners of the pad take over that task. This solution works perfectly. It is clear under what amount of pressure the pad registers these clicks, and the touchpad surface lets fingers glide smoothly. 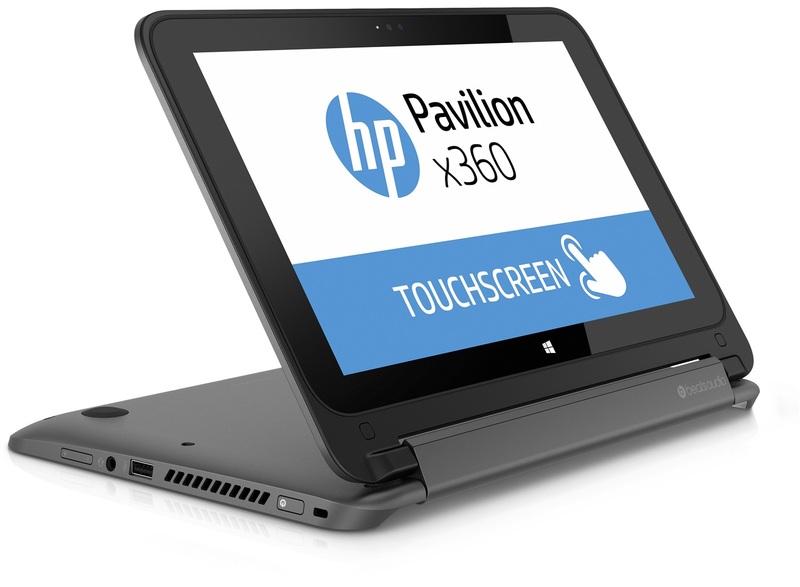 The HP Pavilion 11-n070eg x360's capacitive touchscreen is easy to operate. The multi-touch display reacts quickly to input, and the glossy surface makes work in tablet mode quite comfortable. 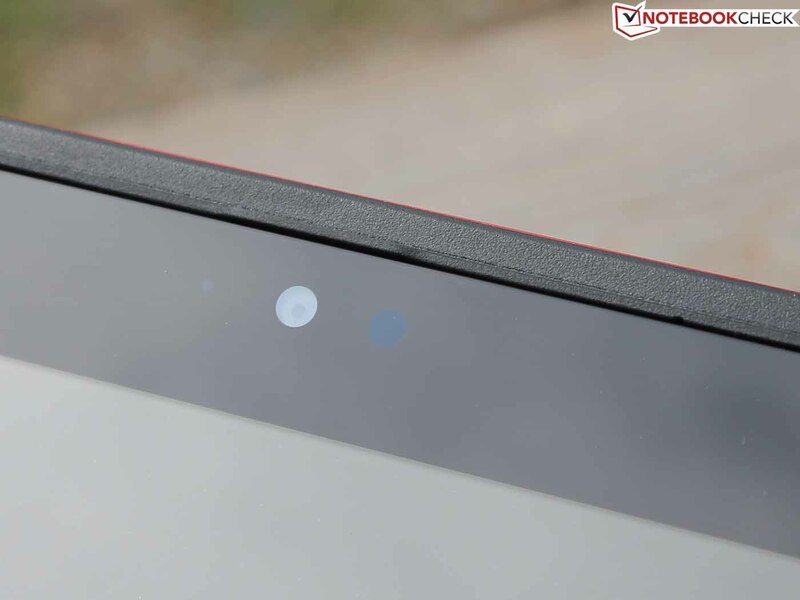 The screen recognizes finger input precisely across its entire surface, even along the edges. HP does not include a stylus, which would offer the advantage of more precise input. The keyboard bed is stable, and the keys sit a good distance apart. Fingers glide easily on the touchpad, and it supports multi-touch gestures. The reason for the convertible PC's low starting price becomes apparent here. 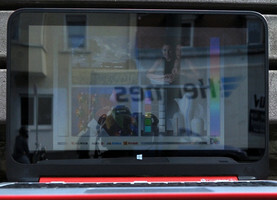 The device's resolution of 1366x768 pixels is considerably lower than the Sony Vaio Fit 11A's Full HD display. The brightness is also on the meager side. 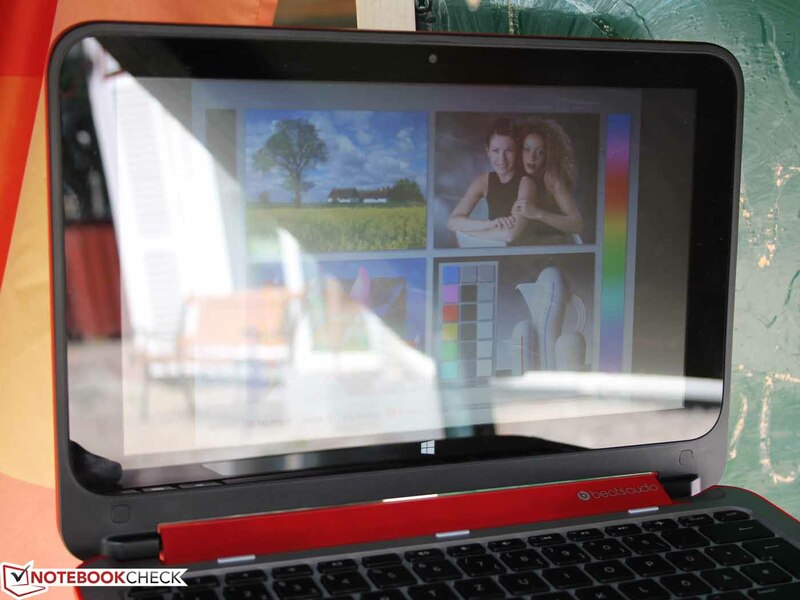 The HP Pavilion x360's maximum brightness comes to 181 cd/m² -- that is less than half of what the Sony notebook offers. The TN-LED panel revealed serious weaknesses when it comes to color, contrast (489:1) and the grayscale in our CalMAN measurements. An average DeltaE 2000 deviation of 10 for colors and 11 for the grayscale is no minor divergence from the ideal values. At 0.37, the black value is low, but the display does not glow especially brightly. Black image content is not a healthy deep black; it pales under somewhat of a gray shimmer. Especially noticeable: The TFT's blue cast. We could not calibrate the display (video OUTs are missing), so we were unable to determine whether a calibration would fix the problem. The display glass is strongly reflective in sunlight, which makes the image content very hard to see under bright sunlight outdoors. Even at the maximum brightness level, outdoor use is sometimes extremely difficult. 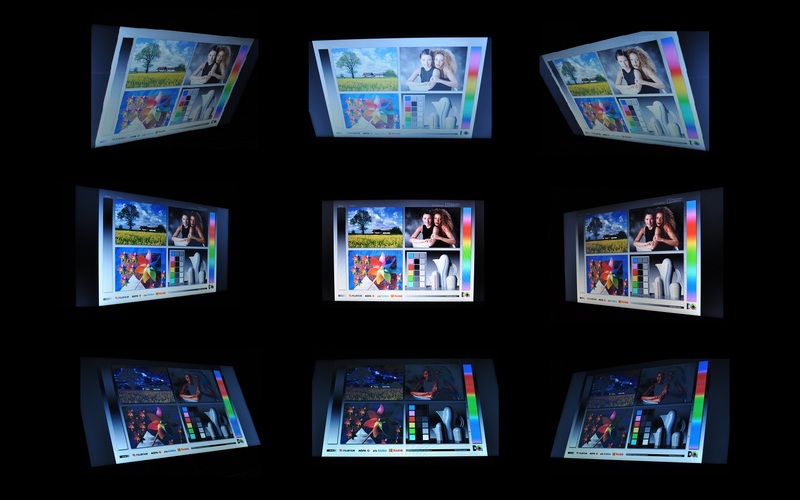 The display is very reflective in outdoor use. If the display is set at even the slightest angle, it is considerably harder to view the screen content. As you can see on our viewing angle chart, the image content looks so distorted that it is difficult to work with the notebook. This is especially problematic in tablet mode. The HP Pavilion 11-n070eg x360 is equipped with an Intel Celeron N2820 processor and 4 GB of working memory (DDR3L-SDRAM). 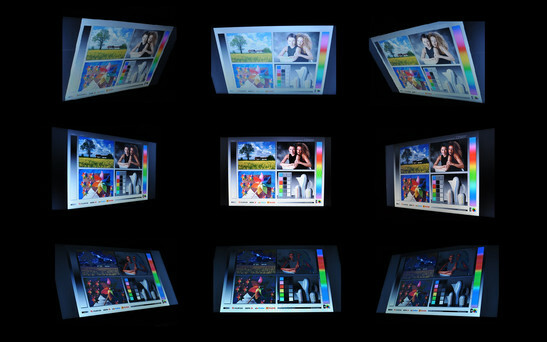 Intel's own HD Graphics Gen7 4EU chip serves as the graphics solution. This chip can use 2 GB of RAM as video memory, but more demanding image editing or games is still not possible with this card. A Seagate ST500LT012, which runs at 5400 rpm and has a capacity of 500 GB, plays the role of hard drive in the HP Pavilion x360. The rest of the competition uses SSDs. 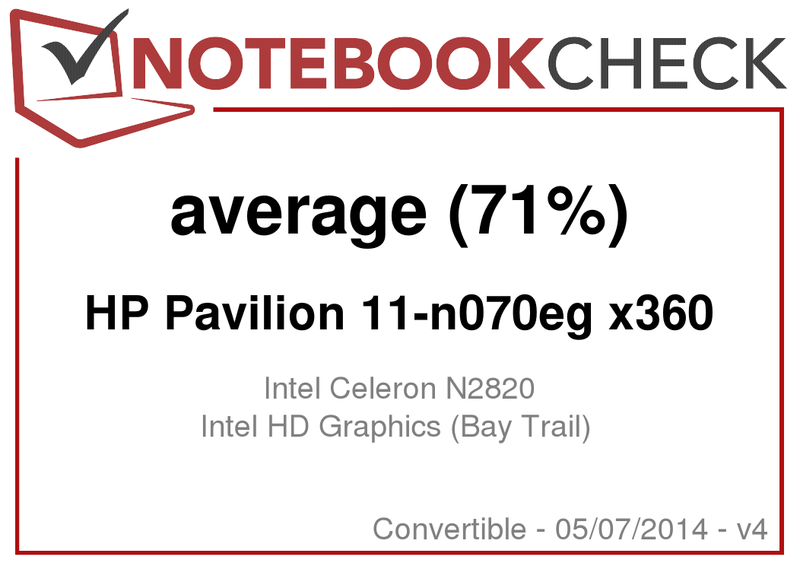 The Intel Celeron N2820 processor in the HP Pavilion x360 is based on the Bay Trail M architecture and clocks at a maximum of 2.4 GHz in turbo mode. The two cores' standard clock frequency is 2.1 GHz. The processor has a TDP of 7.5 W (Thermal Design Power). This CPU also consumes very little energy, though its raw performance could hardly justify anything higher. We were quickly disillusioned with the processor performance. In Cinebench R11.5, the Pavilion x360 only scores 0.51 points in the CPU multi-core test and 0.29 points in the CPU single-core test. The difference between our test device's single-core test core and that of the Sony Vaio Fit 11A is still acceptable, as the latter only managed to secure 0.38 points. 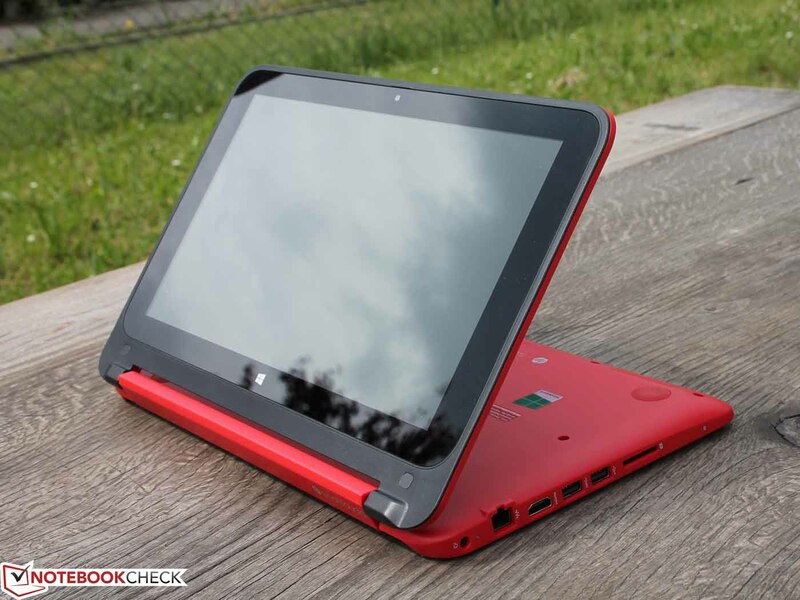 In the multi-core test, however, the HP Pavilion x360 is sorely beaten by the Sony device. The Japanese company's convertible PC score was almost three times higher than our test notebook's (Sony: 1.47 points). 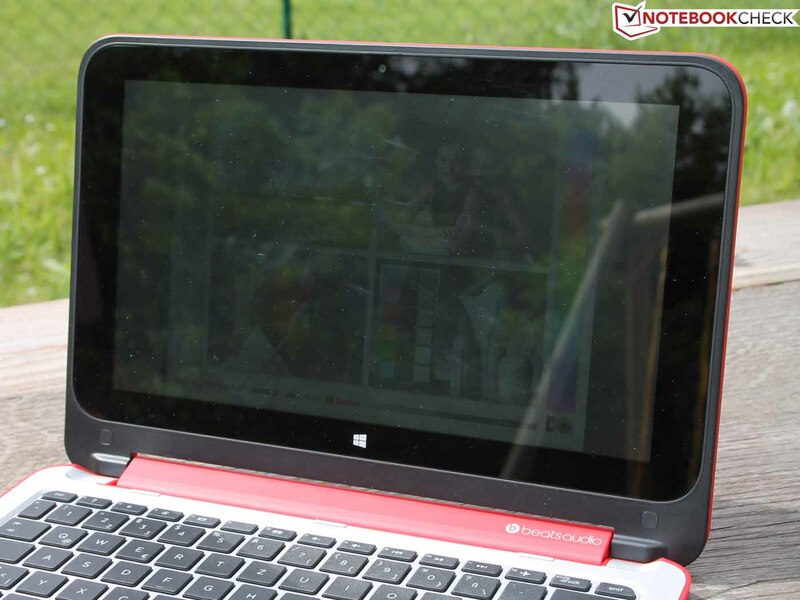 The Sony Vaio Fit 11A's advantage is the result of its Intel Celeron N2920. The Transformer Book (32-bit OS) does 104% better than our Pavilion x360, and we see a similar phenomenon with the Fit 11A. Why is our test unit's Celeron so weak? The two competitors have quad-core processors at their command, while our HP computer has only two cores. With its higher turbo speed, it should at least come in ahead of the competition in the single-core test. This is not the case, however, even though its turbo clock frequency in both the single and multi-core tests was a constant 2.4 GHz. 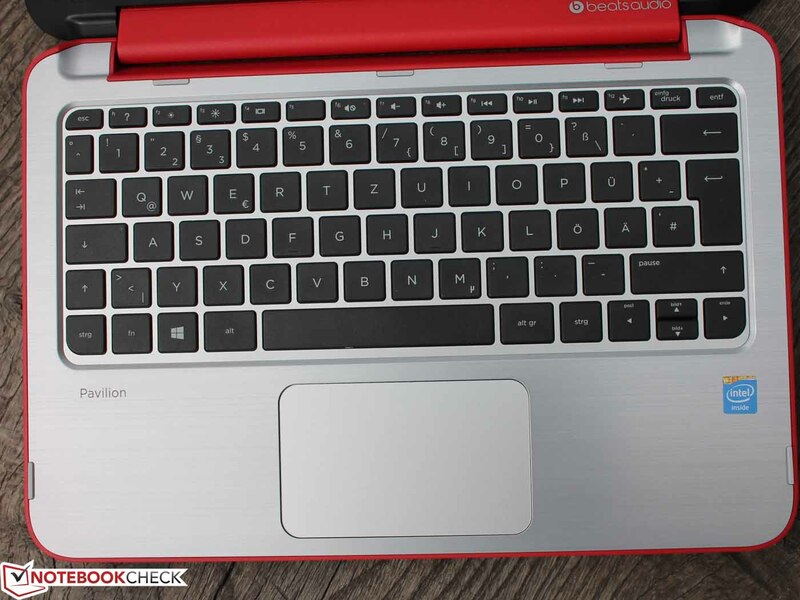 We used the PCMark 7 benchmark test to determine how much is to be expected of the HP Pavilion x360 in practical, everyday use. The x360 scored 1462 points; the competing devices all come in ahead. Because of its SSD, the Vaio beat our test notebook by a factor of almost 100%. This data mirrors the author's subjective impression of the x360: Word processing and navigating within the system is no problem for the notebook. But even just surfing the Internet might require patience; we experienced noticeable lags here and there. As we mentioned above, even the webcam's video recordings are choppy. The convertible PC's low performance is reflected in its low computation score. The T100TA does 61% better here. It is clear from the x360's results here that HP used a normal hard drive and not a fast SSD. The following measurements were recorded by CrystalDiskMark 3.0. At 107 MB/s in the sequential read test and 95 MB/s in the write test, the drive's speeds are more or less what we would expect. The Seagate ST500LT012 is certainly good enough for office use; transferring large files, however, may take some time. The Sony Vaio Fit 11A speeds ahead here with its Samsung SSD (MZNTE128HMGR-000SO), achieving a read rate of 272 MB/s and a write rate of 131 MB/s (sequential). Opening applications takes longer on the HP Pavilion x360's normal hard drive than the Fit 11A's SSD. The T100TA only has eMMC flash storage, but it still puts the x360's HDD in its place when it comes to reading and writing smaller data blocks. On the other hand, unlike the Sony device's SSD, the Pavilion 11 offers a ton of storage space. The Intel HD Graphics Gen7 4EU in the HP Pavilion x360 is in the lower-performance segment of the market. We were unable to determine exact information about the card's clock rates with our software; the only data we could get our hands on was the graphics processor's clock frequency of 533 MHz. The Sony Vaio Fit 11A and the Asus T100TA are both equipped with a similarly low-performance GPU. This graphics unit's name is simply Intel HD Graphics, and the GPU clocks at 844 MHz. Just the 3DMark scores already make clear that this convertible PC is not built for gaming. Part of the problem is that the weak dual-core Celeron limits the graphics performance. With its quad-core Atom processor, the T100TA secures 76 to 110% more points in 3DMark (2013). The Transformer Book's two extra cores also contribute to its lead in the following games. Our gaming tests substantiate our preconceived notions. We tested out the current version of Tomb Raider, BioShock Infinite, and the less demanding FIFA 14. The results are the same for all three games: Even at the lowest settings, the HP Pavilion x360 is unable to render the graphics fluidly. However, for older games, like World of Warcraft, the notebook's performance should be sufficient. Since there is no high-performance hardware that needs to be cooled, our test device's system generates little noise. We measured a minimum sound pressure level of 31 dB(A) in idle mode; under maximum load the number rose to 37 dB(A). The fan is preset in the BIOS to run continuously in AC power mode (to access this, hold down the Escape key during the system boot and press F10 in the menu). We deactivated the familiar "Fan always on" option. As a result, the fan turned off now and then, leaving just the whirring of the hard drive. The Transformer Book has no fan and is completely inaudible. On the other hand, at a maximum of 45 dB(A), Sony's Vaio Fit 11A tended to grow rather loud. As you can see, there are immense differences between our competing devices in this discipline. In idle mode, we measured a maximum case temperature of 30 degrees Celsius (86 °F). After completing our hour-long full-load test, the device's temperature rose to 39 °C (102.2 °F). That means the Pavilion can grow uncomfortably warm. At a maximum of 31 °C while idling (87.8 °F), the Sony Vaio Fit 11A is just a tad warmer than the HP Pavilion x360, and under full load the Sony device's case temperature reaches all the way up to 51 °C (123.8 °F). In our stress test, the HP Pavilion x360's Intel Celeron N2820 processor heated up to a maximum of 54 °C (129.2 °F) at a maximum clock frequency of 2.4 GHz. Once again, we could not determine the GPU temperature. The HP Pavilion x360 boasts a Beats Audio logo. This technology should generate excellent sound quality. And indeed, the stereo speakers produce a respectable sound while playing videos and music. However, since HP chose not to install a subwoofer, there is no bass, and high notes are not rendered quite as cleanly as on other Beats Audio devices. 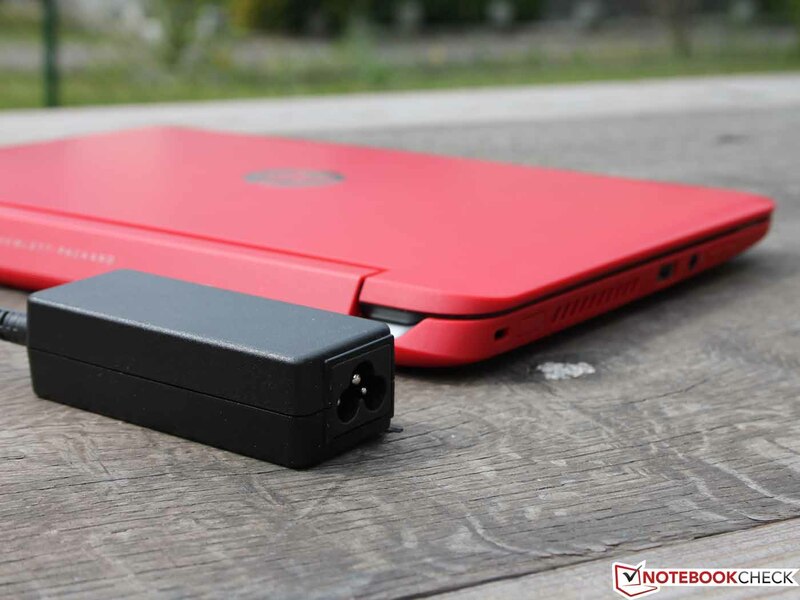 The HP Pavilion x360 consumes a minimum of 5.2 Watts in idle mode. Under maximum load, the device uses up to 16.1 Watts. At these numbers, our convertible PC needs more energy in idle mode than the Sony Vaio Fit 11A in idle mode (3.1 Watts), but less under full load. Here the Sony device consumes up to 20.6 Watts. With its quad-core SoC and better performance, the T100TA still proves to be the most frugal of the three competitors: In idle mode, the Asus notebook uses 50 to 60% less energy, and under load, the numbers are about 30% lower. 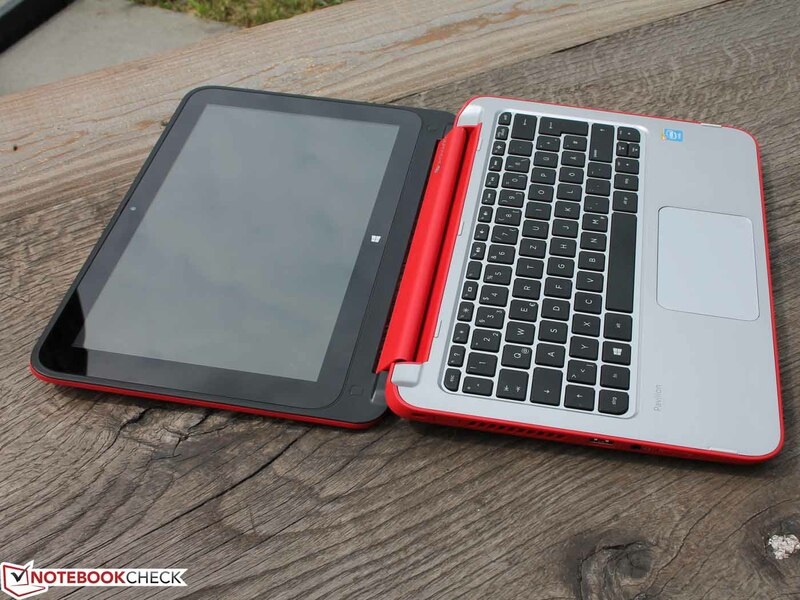 At 29.0 Watt-hours, the HP Pavilion x360 is sufficiently equipped as a convertible PC. The battery is permanently installed and cannot be switched out. 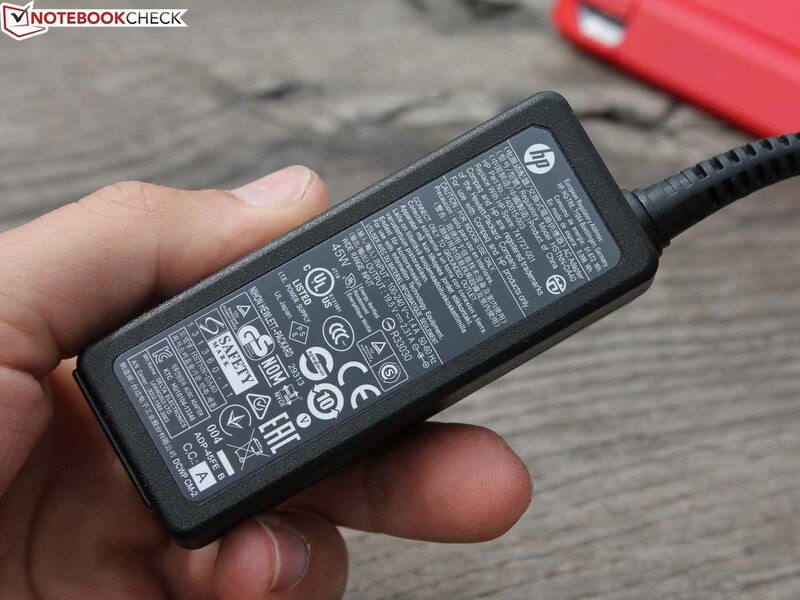 Unfortunately, the HP device's battery life proves to be shorter than we expected of an energy-saving chipset. In fact, even with its smaller number of Watt-hours (24.6), the Sony Vaio Fit A11's battery holds out considerably longer. In our WLAN surf test, the Sony notebook had over four hours worth of steam. The HP Pavilion x360, on the other hand, throws in the towel after a little over three-and-a-half hours. The Transformer Book comes in rather far ahead of the other two devices, flaunting its lower energy consumption level. 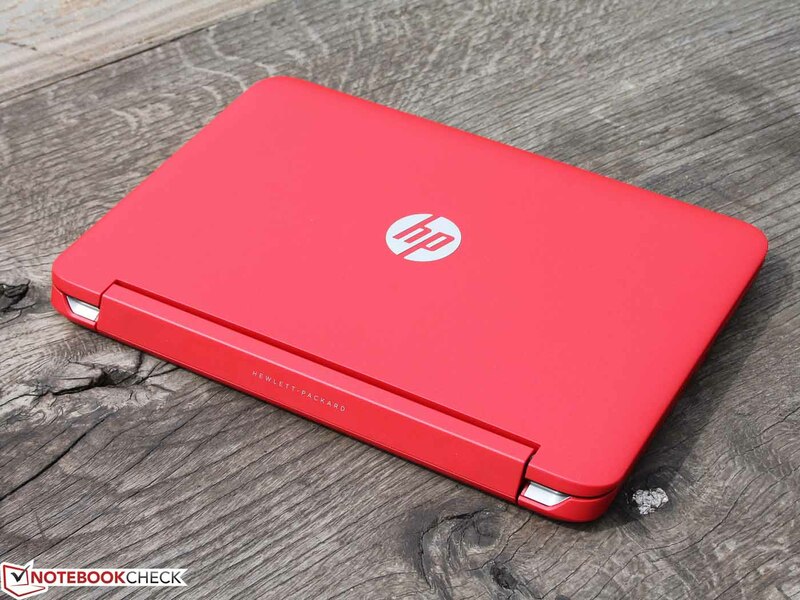 The HP Pavilion x360's design is very attractive. Its high-class aluminum at a price less than 400 Euros (~550 USD) is certainly appealing. 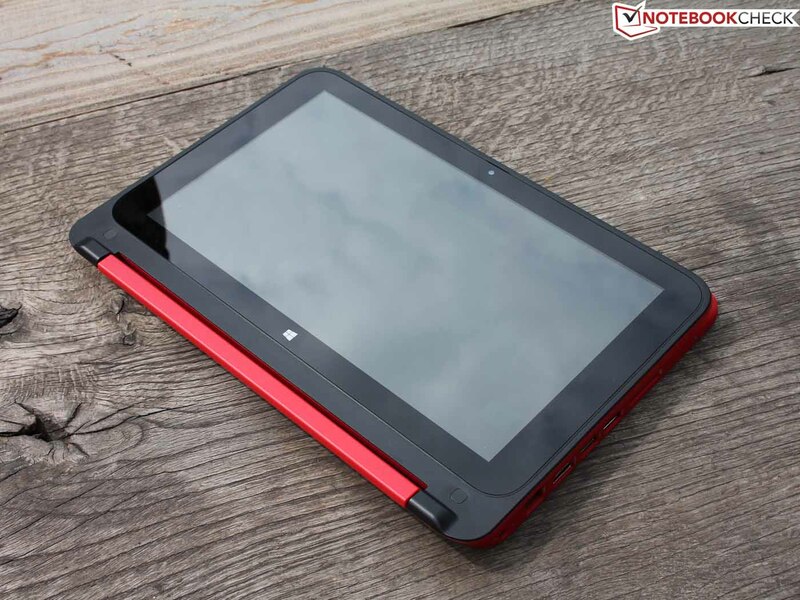 However, its viewing angles are rather limited, its panel is not very bright, and it does not have quite enough performance to surf the web without delays -- all of which speak against the convertible PC. 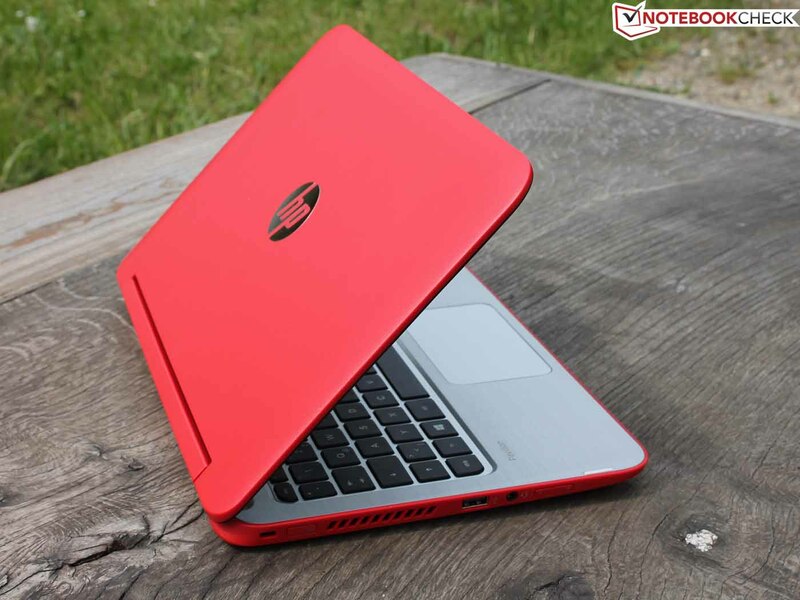 If you want to use the HP Pavilion x360 mostly as a transportable device for taking notes or as a second office device, it could be entirely sufficient -- as long as you do not expect too much of the keyboard. In tablet mode, the convertible PC does very well with touch input, though in extended use the display's narrow viewing angles and lack of brightness get to be a pain, as does its heavy weight of 1.4 kg (~3.1 lbs). In short -- the manufacturing quality and the design are great, and as a portable supplementary device, the HP Pavilion x360 certainly might appeal to some people. However, if you want more performance, a very good display and a better keyboard, we recommend you look at the Vaio Fit 11A (Celeron) or Transformer Book T100TA (Atom). Both of these devices have an IPS panel, and even though they have similar Bay Trail processors, we did not experience any frustrating delays in our tests. The same goes for the direct competition from Lenovo, the Lenovo IdeaPad Yoga 2 11, which runs a little faster (even though it also has an HDD). The 11.6-inch Yoga 2 also has a 360-degree hinge, though it has a different mechanical design that is not quite as solid (more delicate) as the one the Pavilion x360 has to offer. 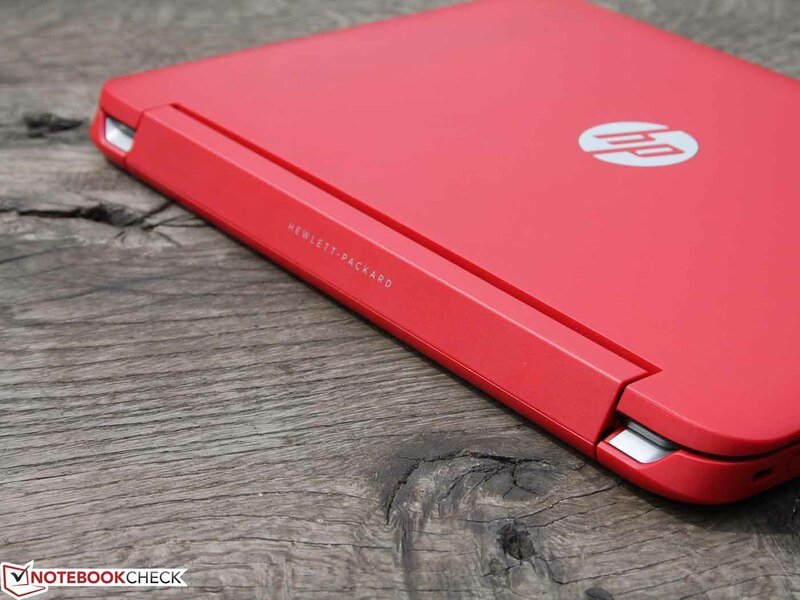 Despite the fact that the HP Pavilion x360 is constructed mostly of plastic, it looks very sophisticated. Its manufacturing quality is also generally very good. A better panel with fewer problems displaying image content. 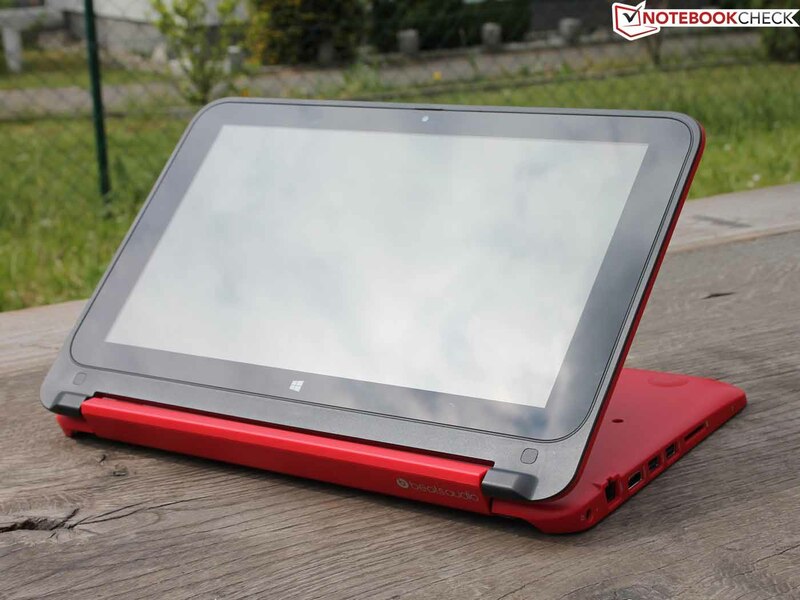 Even though it is pretty small, the HP Pavilion x360 is quite heavy and therefore can only be used as a tablet-replacement for short periods of time.